"I washed me hair, went down to the studio, met Franc Roddam and sat around discussing Herman Hesse - The Glass Bead Game, I think. Suddenly, he said, 'You're perfect. You look perfect.' I got the job that day. It transpired during the conversation that followed that I was going to appear in a two million dollar movie. And I'd never even been in a school play." "That wasn't me in 'Quadrophenia' at all. I was nothing to do with mods. When that whole mod revival happened we exploited it, and for a brief while I became a figurehead for it. People ask me now, though, what I think of mods... Well I don't like them. I'd rather have a motorbike. But it was well used, I think. I'd wear a parka at the odd gig..."
"You'd better put 'acting' in inverted commas. As far as I'm concerned, acting is something you do on stage where you create and sustain a role. In a film you don't do that. You hang around, say one line, then hang around again. The camera is so close to your face you can't register much expression or make any dramatic gestures! That's why the best film actors are non-actors. Clint Eastwood has a totally wooden face and Steve McQueen only has about one expression. When I did 'Quadrophenia' I used the same expression all the way through and in 'Radio On' I was just being me and not really acting at all!" "My wife persuaded me to audition for the part of Ace Face in 'Quadropheni'a, and when I got the part, I found I really enjoyed doing it. But then I also decided that if I wanted to get serious about acting, I had to be very careful about what roles I picked. So I deliberately waited and chose vehicles that were more left field. The easiest thing would have been to accept one of the dreadful musicals people kept sending me. That's why, apart from doing 'Radio On' and 'Artemis 81' for the BBC, I waited two years before doing Martin in 'Brimstone and Treacle'. It was a very ambiguous role, which also appealed to me - the irony of a character who's described by the author as "being, or who imagines himself to be, a demon." "That performance was...me, actually. Definitely part of me and very easy to do. I'm not an 'actor'; looking good on screen is just a matter of intelligence. I was lucky in that film because I was in it just long enough to create a big impression, and not long enough to blow it. It was perfect. The Police did a lot for that movie actually. The week it came out in England we were number one. I know for a fact they waited until the Police had toured Australia before they released it there." "Quadrophenia" (1979) is the first of two films in which Sting worked with director Franc Roddam ("The Bride" also). 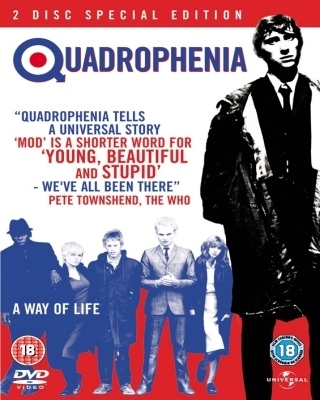 Based on The Who's 1973 album of the same name and exuding the same youthful defiance as the band's My Generation days, "Quadrophenia" is set in mid-60's England and chronicles the violent rivalry between the 'mods' and the 'rockers' (a pair of antagonistic gangs of young working class Brits) as seen through the eyes of a disaffected mod named Jimmy (Phil Daniels). Set against a backdrop of Who anthems the film follows Jimmy's struggle to find a status, identity and glamour for which he yearns, and for which he seems to find for a few fleeting moments at an adrenalizing mod/rocker weekend clash in the English resort town of Brighton. Jimmy is especially seduced by a charismatic mod leader known as Ace played by Sting in his early Police days. A largely non-speaking part, Ace is all attitude and posturing, his alluring presence drawn from the sneering faux-punk arrogance of the day. Although his screen time is limited he nevertheless plays a pivotal role in Jimmy's growing self knowledge. In the climactic scene in which Jimmy learns that Ace's sneer is merely veneer, he comes to the film's helpless conclusion that it is his working class status and not his working class rivals that truly impedes his empowerment.